Isabella Sutherland died 31st May 1938 aged 71. 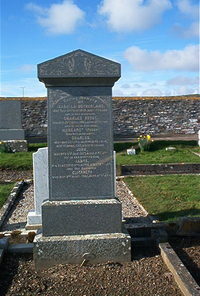 Charles Budge died 29th April 1902 aged 36. Daughter Margaret (Peggy) died in infancy. Son Charles Budge killed in action in France 8/10th April 1917 aged 18. Son John Budge died 4th July 1927 aged 31. Adopted son James Budge died 22nd October 1926 aged 20. Daughter Elizabeth Budge died 8th April 1952 aged 57.